The Criminal Investigations Department (CID) has confirmed that owner of the troubled Menzgold Ghana Limited, Nana Appiah Mensah, aka NAM1, was released on bail by a court in Dubai, United Arab Emirates (UAE) but re-arrested by the police in the Emirati country. The Director General in charge of the CID, Deputy Commissioner of Police (DCOP) Maame Yaa Tiwaa Addo-Danquah said at a news conference in Accra yesterday that NAM1 would be handed over to the Ghanaian authorities after the case in Dubai. She confirmed that NAM1 was re-arrested by the Dubai Police based on what she called 'red notice alert' from Interpol on the request of the Ghana Police. DCOP Tiwaa Addo-Danquah told scores of journalists that NAM1's request for bail was granted on March 4 by the Dubai Police. “He executed the bail on March 24, 2019 and got the release letter on March 25, but was re-arrested based on the red alert from Interpol on the request of the Ghana Police,” she said. The CID boss revealed that NAM1, who is currently in custody, would be handed over to Ghana after the court case. 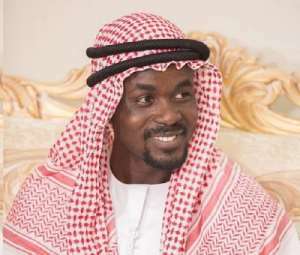 It's emerging that the Dubai prosecutors realized that a prima facie case might not necessarily be established against NAM1 in a $51 million gold deal, and as a result the court started to 'relax' the restrictions placed on him. However, Interpol's intervention ensured that he was still kept in custody as person of interest in other parts of the world, including Ghana. According to reports, the Dubai authorities are particularly on the heels of one Adetunji Adewoye Olorunfemi, aka Ade, who is believed to be involved in the $51 million gold deal for which NAM1 has landed in trouble. The said Ade, according to DAILY GUIDE's sources, was placed on the 'Stop List' at the Kotoka International Airport (KIA) after the Bureau of National Investigation (BNI) detected that he was using both Ghanaian and Nigerian passports at the same time. He reportedly outwitted the security agencies by travelling by road to Nigeria to escape arrest instead of using KIA. A source claimed between 2012 and 2016, Ade used a Ghanaian diplomatic passport even though he did not qualify for it and used the birth date – January 12, 1976. Interestingly, in Ade's ECOWAS Travel Card, he uses the name Ogumtomole Yinka with the birth date 01-12-1980. Advocates of NAM1 have been making 'serious' statements about the said Ade, particularly on social media. They claimed the Nigerian is crucial in the $51 million gold deal for which the embattled Chief Executive Officer (CEO) of the gold collectibles firm has been held in Dubai since December 7, last year. They posted the travel documents of the said Ade on social media. DAILY GUIDE's investigations in February revealed that there were a total of 4,998 customers of Menzgold and not the estimated 46,000 as published earlier in the media.